Strauss and Mahler are closely linked as being two of the three great Lieder composers born in the 1860s. The third was of course Hugo Wolf, and he was the most important influence on Othmar Schoeck’s song composing. Schoeck was a sedulous producer of songs and after his Serenade for small orchestra Op. 1 the next 19 opuses – with one exception – were songs, often with several songs within each opus. And he continued in the same vein until what I believe is his last work, Nachhall, Op. 70, a suite of 13 songs to texts by Lenau. In all he wrote more than 400 songs and is regarded as the last master of Lieder and sometimes even as the last Romantic. Wandsbecker Liederbuch, recorded here, was his opus 52, finished in January 1937. It is not a cycle in the usual sense, but rather a suite with the seventeen songs organized in four groups, each with a specific theme: Die Liebe (Love), Die Nature (Nature), Der Mensch (Man) and Der Tod (Death). The texts are by Matthias Claudius (1740 – 1815), who between 1771 and 1775 regularly published reviews and poems in the magazine Wandsbecker Bote. They are sometimes quite simple, sometimes merry, sometimes serious. Many of the songs are quite brief and in a few places they are separated by short interludes, separately banded incidentally. Stylistically the songs span over a wide scope but the Wolf influence looms constantly over the proceedings. Often adjacent songs are sharply contrasted. Thus the bold, dramatic and rather boisterous Ein Lied, hinterm Ofen zu singen (tr. 16) with a spectacular inflated accompaniment is directly followed by Abendlied (tr. 17), which is soft, inward, sparse and beautiful. Hearing the songs for the first time some of them are more immediately attractive than others. For me the two mentioned above belong in that category, as do the inward, beautiful and tender-hearted Ein Wiegenlied, bei Mondschein zu singen (tr. 9) and the very short Die Natur (tr. 11). Also the expressive Der Schwarze in der Zuckerplantage (tr. 21) and the fateful Der Krieg (tr. 22) are highly approachable. But as so often it is the total experience, the sum of the parts rather than the individual numbers, which is so touching. Schoeck’s songs are not performed too frequently – I can’t remember hearing any of them in live recitals – and recordings of them are comparatively few. There is a complete edition on the Jecklin label – which I haven’t heard – and that seems at present to be the only alternative recording of Wandsbecker Liederbuch. In volume 7 it is coupled with Lieder Op. 51 and 35 and sung by Juliane Banse and Dietrich Henschel, two distinguished Lieder interpreters. But young Britta Glaser is also an eminent singer, equipped with a bright beautiful lyric soprano voice and she sings with great charm and exquisite phrasing. She is also a splendid interpreter of the Strauss and Mahler songs that frame the Schoeck cycle. Strauss’s well-known Ständchen is a fitting opening number and it is followed by the too seldom heard Die erwachte Rose, a setting of a poem by Polish born Friedrich von Sallet, primarily known for his political and religion-critiquing poems. The three Mahler songs, two of them with texts from Des Knaben Wunderhorn are sung with fresh tone and great charm. Ablösung im Sommer is particularly enticing, performed with a glint in the eye. As conclusion of the programme, after Schoeck’s Spruch, which says in the English translation: “Man lives and breathes / for a short time only / and the whole world in / all its glory must perish. / One alone is eternal and at all endings / and we are in his hand.” Britta Glaser sings another Wunderhorn song, Urlicht, originally the fourth movement from Mahler’s second symphony. The text relates directly to the previous song: “O red rose /Man lies in direst need /Man lies in direst pain / I would rather be in heaven /I then came upon a broad path / An angel came and sought to turn me back /Ah no! I refused to be turned away / I am from God and to God I will return /Dear God will give me a light / Will light my way to eternal blessed life.” She sings it with great warmth and rounds off the sensitively planned programme with lovely nuanced readings of Strauss’s Wiegenlied and Befreit. 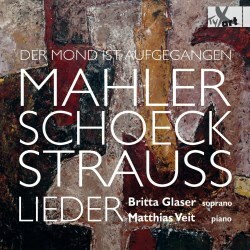 Matthias Veit is an excellent pianist and the recording leaves nothing to be desired. Strauss and Mahler are well-known quantities to all lovers of Lieder and here they support the much lesser known Schoeck in an exquisitely planned programme. Wonderful singing of wonderful songs!